In Little Earthquake’s stage adaptation of Edgar Allen Poe’s ‘The Tell-Tale Heart’ I share the stage with the actor Laurence Saunders creating live foley sound effects as he recounts Poe’s dark and gripping tale of murder in the dark. The performance demands several hundred sound cues, some are recorded sounds but the majority are amplified live sound effects created with a huge variety of props, drawing on the techniques of film foley and radio drama. 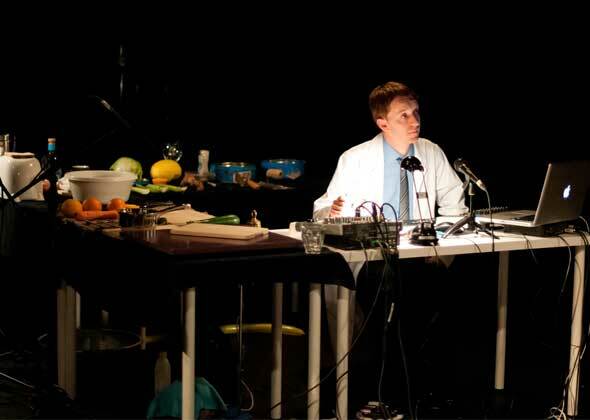 It is sound artist Iain Armstrong’s audio effects though which make the performance. Set up on stage and many performed alongside the physical action rather than being recorded, it is both fascinating and incredibly skilled. What makes this play so excitable, and doused in dark humour, is that Simon shares the stage with a sound artist – Iain Armstrong. As Simon retells the story, Iain provides the sounds from a table of strange and fascinating props. Dismembering flesh is a knife through a melon, twisting off the old’s man arms and legs becomes crunching celery, and blood dripping from his loose bones is water trickling into a tin bowl. In fact, the audience are in awe of what prop will be used next – the most gruesome of which is a knife through an orange as Simon self-mutilates himself on stage. The play certainly makes you look at fruit in a whole different way! This is a great way to retell a Gothic classic and Saunders creation of the mad nurse is worth the ticket price alone. Covered in blue plasters, bandages, and a nurse’s outfit, Saunders creates Poe’s Simon perfectly – as a man descending further and further into madness as the story unfolds. 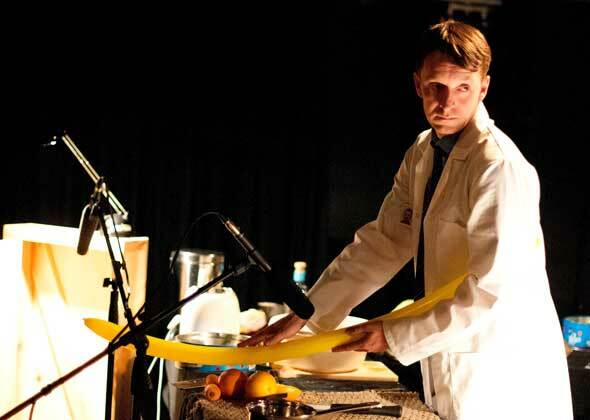 Armstrong alone is worth watching, as he commands his sound desk, juggling fruit, laboratory equipment and kitchen appliances making sure to hit the more than 200 sound cues. The results are, often, extraordinary. From the bigger set piece moments (the bloody dismembering of a body, for example) down to the subtle nuances that pepper the piece (footsteps on a floorboard; the creak of an opening door) the effect it leaves on its sometimes squirming audience is profound. Similarly, in his role as Doctor, Armstrong is perfectly constrained, his soft Scottish brogue coming through the tinny microphone never detracts from the main events of the piece, which belong to Saunders’ Simon. The show is touring English studio theatres and rural touring venues from the Autumn 2013 until Novemebr 2014. You can find more info and booking details on the Little Earthquake events page.